If you are not Romani, never wear Gypsy-themed costumes at Hallowe’en. And don’t call yourself Gypsy because you think you’re free spirited. Or because you’ve been to India, or believe in chakras, or live in a campervan or something. These things are racist towards Romani people. It’s called antigypsyism. Antisemitism or islamophobia, which are perhaps the closest analogies, aren’t exactly comparable. 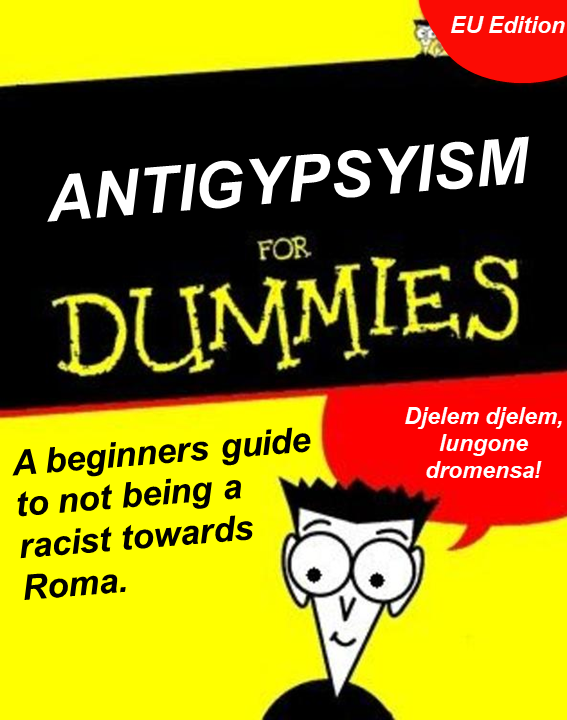 This is because antigypsyism is not just expressing anti-Roma attitudes, hate speech or negative stereotypes. It is more far-reaching, more implicit, more embedded in European societies. It is rooted in half a millennium of hatred, suspicion and persecution which has only compounded and grown more amorphous with the passing of the centuries. Discrimination against Roma is not just racism; it is a component of Europe, which has grown alongside European civilisation since the Middle Ages. It’s the staggering, systematic depth of it that sets it apart, and once you start noticing it, you can’t un-notice it. It’s absolutely everywhere, impossible to miss, and you’ll wonder how you never spotted it before. Bearing this in mind, the first step to becoming aware of antigypsyism and fighting it, is recognising that it isn’t a ‘minority issue’. It’s not about the ‘Roma problem’ or the ‘Traveller problem’. It’s not about solving issues with the ‘Gypsy community’. It is a phenomenon of our society, a common heritage for all of Europe, created by the way we other those considered to be ‘gypsies’. It is the things which are said, and which are not said. It is the product of thousands of historical acts of persecution and their socio-economic effects on Romani populations today. It is the ignorance of these past actions by the majority society. It is the essentialising of culture into fairy-tale tropes of evil fortune tellers and dancing seductresses. It is the appropriation of Romani images and cultural practices at the expense of real people. It is the unequal access to clean water, to safe housing. It is the geographical segregation of Roma from non-Roma. The sky-high unemployment. The drastically lower life expectancy. The Dickensian level of infant mortality. It is the pervading prejudices in the police, judiciary, government, social care system, immigration authorities and health services. It is the fundamental condition in the collective psyche that sees them as ‘gypsies’, and therefore on a basic level, less than us. The accumulation of layer after layer of small and great acts of discrimination, ultimately means the system becomes self-reproducing. Antigypsyism can continue without individuals involved necessarily being conscious of, or intending, discriminatory practices. Conversely, it’s so systemic that it affects Romani individuals regardless of whether or not they have personally faced unequal treatment or direct discrimination. The Gypsyism, which is the supposed target of this discrimination, of course does not exist. It is a mirror-image of the norms of our society. A foil. A marker for the boundaries of what is civilised and what is wild. Our societal identities do not extend to include ‘gypsies’, so actions which further their exclusion only strengthen the in-group’s identity. Similarly, any positive actions towards them are perceived as handouts given to an ungrateful group which refuse to integrate – rather than necessary steps taken to secure their equal rights as humans. The next point to understand is that all of this nasty business of hatred and persecution which has given rise to, and perpetuated antigypsyism, isn’t the fault of Romani people. Not even a little bit. It’s not because of their poverty, or their supposed difference to mainstream society. Racism is not a symptom of Romani poverty, it is exactly the other way around. The fact that Roma happen to be the poorest people in Europe is not a coincidence, it’s a consequence. So efforts to integrate Romani people into our society, with their weird cultures and apparent love of existential poverty, misunderstand the cause and effect of antigypsyism. The thing all of Europe has in common which allows antigypsyism to flourish is the remarkably high level of social acceptance it receives. Whereas other forms of racism have varying degrees of social and moral stigma attached to them, antigypsyism is usually exempt from this rule. Institutional racism as well as everyday hate speech are the norm rather than the outrageous exception. This is the glue which allows the cycle to perpetuate, cements prejudices and confirms biases. When discriminatory action is taken against those termed as gypsies, it is either celebrated, justified or hardly even noticed. The scale of the phenomenon makes the fight against it all the more daunting, but the first step is recognising that it exists. We have already secured this in a loose sense from the European Parliament and the European Commission (who use the term antigypsyism at least). But it needs popular recognition and condemnation from ordinary people in order to dismantle its structures, spokespersons and practices. If people were as outraged about students dressing up as Gypsies as they were about them dressing up as Black people, it would be a start. In the meantime, challenge discriminatory behaviour wherever you spot it, explain antigypsyism to accidental racists, and if you need more information, or want to throw in your support, join the movement and sign up to the Alliance Against Antigypsyism here. Originally published in the Norwich Radical.